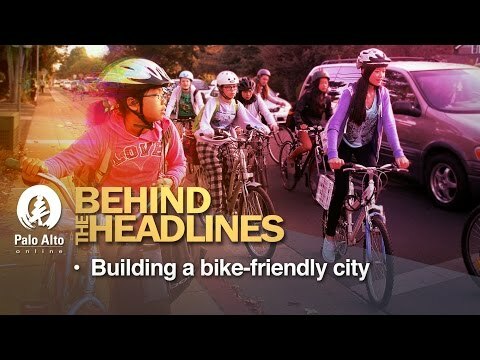 On this week's Behind the Headlines, Robert Neff, chair of the Palo Alto Pedestrian and Bicycle Advisory Committee, joins Weekly Editor Jocelyn Dong and reporter Gennady Sheyner to discuss the city's push to make local streets more bicycle-friendly. Great interview. A big thank you to Robert and his committee for their work on making Palo Alto safer for pedestrians and bicyclists. We always see the worst of the city at those choke points where the bike lanes end and speeding cars blast their horns at you as you just try to get home safely (like San Antonio Road across Hwy 101 or Middlefield Road & San Antonio or Charleston & El Camino). Hopefully some those projects that Robert talks about will make our streets safer and smoother for everyone in a timely manner. There are some very difficult intersections for bikes particularly at times where school commutes mean that there are often 10, 20 or more bikes waiting for a light to change. The ones that come to mind are Churchill/Alma, Bryant/Oregan, Meadow/Middlefield and Loma Verde/Middlefield. At each of these, it would be a good idea to have separate bike traffic light in the sequence and also more waiting space for the bikes away from motorized vehicle waiting queues. A flock of bikes waiting causes all the other vehicles to be surrounded by bikes that are much too close (under the legal 3') and quite often the cars can't move until all the bikes have cleared the intersection and by that time only one car per green gets by. Most of Palo Alto is very dangerous for bicyclists. This is due to distracted drivers (texting, etc) as well as residents driving on international licenses, who have NEVER taken an on-the-road driving test, only a cursory written test in their home country! Supposedly CA does not honor international licenses, but that seems to apply only to car RENTALS, not car SALES! Car dealers don't care who they sell to, and they are selling big cars to inexperienced drivers who don't know the rules of the road, causing them to hit bicyclists as well as other cars! I personally have been hit twice by inexperienced foreign drivers while riding my bike home from my job at Stanford. The PAPD officers on both occasions informed me at the hospital that the driver was driving on an international license-- yet made no arrests! The drivers were cited, in both cases, and had to appear in court, as well as but me a new bike both times and pay my very expensive Stanford Hospital bills as well as physical therapy, punitive fines, reimbursement for missed work and pain and suffering. Still, this did not help me heal any faster! Isn't there more that Palo Alto and the state can do? I am too terrified to bike ride to work any longer! Palo Alto is one of the safest places to ride a bike. It has been that way for a long time. Those who call this place dangerous must have never lived somewhere like Los Angeles. The city has thrown our tax dollars down the drain trying to build bicycle infrastructure in an effort to change people's behavior & choice of transportation. It is more about environmentalism than it is about safety. The TMA has a stated goal of reducing car traffic, which flies in the face of reality as the population skyrockets. So instead, they create artificial choke points which cause needless congestion. Its like placing an immovable object in the path of an unstoppable force. Completely illogical road engineering. You need look no further than what has been done to N. California between Alma and Middlefield. I have yet to see anyone ride through the hideous, useless two-way bike lane on the left. We really ought to campaign for the entire mess, along with the bollards, to be removed. Just the other day, a cyclist was trying to ride legally on the right side of the road there, but he had no room to share the road with cars because they made the road so narrow for no good reason. He had to pull over behind parked cars that were taking up the right side of the road so cars could get through. Dangerous behavior is caused by congestion. We can accommodate bicyclists, but we shouldn't become hostile towards cars (the vast majority of traffic) in order to do so. Drivers here are generally courteous. It is a myth that all car drivers are vicious killers while all cyclists are innocent and somehow morally superior for riding bicycles.